Show off floors that you can be proud of when you install our sleek tile flooring. 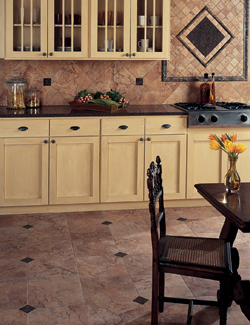 With a tile flooring installation from our reputable store, you can easily upgrade the appeal and value of your home. Customize your look by choosing from our large selection of tiles in different sizes, shapes, colors, and textures. Imagine how stylish your property will look with our top-quality products. From your dining room to your back porch, our flooring is available for every room in the house. Getting the flooring of your dreams has never been easier. When you come to us for your tile flooring installation, our skilled crew takes care of everything, from beginning to end. We use the industry’s best equipment and practice proven methods of installation, in order to ensure your floors look great and last for many years to come. Contact Us to bring your floor design visions to life with our decorative tile flooring. We proudly serve the residents of Williston, Bristol, Burlington, Grand Isle, Westford, Colchester, and Jericho, Vermont.